One such naturally occurring region is the wild buckwheat fields in northeastern Ontario, above hwy 7 on the route to Ottawa, the capital of Canada. There are many wild flowers here and some blossoming trees and even some swamp plants that yield single variety honey crops. Any plants with a distinctive fragrant flower blossom is sure to bear nectar that bees can consume and regurgitate into gourmet honey. Of all the known honey flavours of Ontario however, there is perhaps none more distinctive as buckwheat honey. 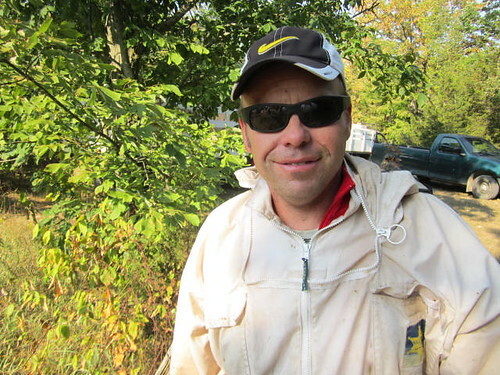 Alfredo Malanca is a hobby beekeeper in northeastern Ontario with less than two hundred hives who always ends finds a strong buckwheat flavour in his honey crop. Alfredo is a friend of ours who doesn't have any harvesting equipment of his own, but rather he relies on our team to gather his crop in exchange for half of the yield. 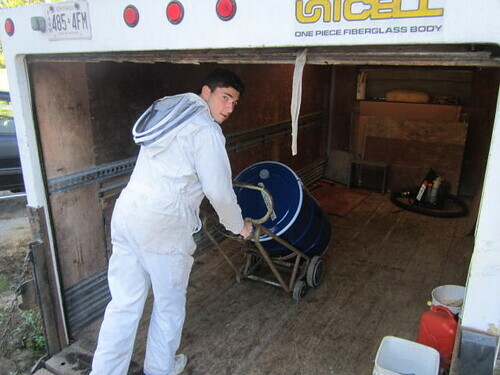 This is smart business for him because it leaves him free to sell the remainder of his highly coveted honey to specialty packers for top dollar. Buckwheat honey can fetch as much as five dollars a pound in the barrel. In the same way corn and soybean farmers across Canada have specialized their trade to realize the largest possible return for a minimum of effort and investment, so too have commercial beekeepers. By not maintaining a honey house or any retail sales and storage facilities, some beekeepers in this province now sell their honey in exchange for help harvesting the haul. The deal is steep for small timers and more generous for professional sharecroppers with lots of hives - the profits can be staggering if veteran sharecroppers can prove their honey has a distinct single variety flavour. The twangy flavour and sweet musty aroma of buckwheat honey in Alfredo Malanca's summer crop is so powerful you can actually smell it in the beehives. It was a hot day and there was no wind when we gathered his crop, As soon as I removed the lid and inner cover on many of his hives, I could smell the distinctive sweet musty aroma in the air. Buckwheat is not related to wheat, but rather its connected to rhubarb, sorrels and knotweed. This melliculus nectar pumping plant produces a distinctively musty and twangy flavour honey which has a strong pungent aroma. Some people find the odour of Buckwheat honey overpowering, but there are just as many people who treasure the taste. Buckwheat was one of the earliest crops introduced by both French and English settlers into North America in the mid 1500s. That's because buckwheat grows quickly, and yields a seed crop that will fill men's bellies in short period of time. Buckwheat plant will produce seed in about 6 weeks and ripen at 10 to 11 weeks. The species we have in Ontario will grow 30 to 50 inches (75 to 125 cm) tall. The grain is labelled a pseudocereal to emphasize that the plant is not related to wheat even though it bears a seed crop. Toronto area honey packers buy buckwheat honey to put into glass jars and sell in specialty shops for gourmet cooks and chefs. There are dessert menus in Toronto roof top patio fine dining often have vanilla cake with Buckwheat honey as dessert option. It tastes excellent with coffee. The exquisite taste is unforgettable and honey packers will pay a premium to put it in glass.